Christmas is on its way and that means it will soon be time to hang our stockings. I wanted to make a crochet fox stocking for my daughter’s first Christmas and the Designer Remix provided the perfect opportunity! Pam at Sincerely, Pam had already designed a beautiful crochet stocking with a reindeer motif. I just had to add my own foxy twist. What is a pattern remix? Pamela at Sincerely, Pam had already designed a beautiful crochet stocking with a reindeer motif. Instead of making a new stocking pattern, I have obtained Pamela’s permission to create an add on or second motif to provide the crochet community for here crochet stocking design. In order to create the Fox Stocking you will first need to follow her Crochet A Long for parts 1 and 2. Then you will use the instructions below to create the center section using the Fox Motif and then jump back over to Pamela’s blog for part 4. And Volia! you have a Fox stocking! So let’s take a look at what we need for the Fox version of this stocking. Do you like Free Printables? Check out the free printables I have created for my newsletter subscribers! You will need less than 100 yards of the two main colors and less than 20 yards of the design colors. After completing your heel, you will switch back to your main color. Like the rest of the project you will not turn at the end of the row.. I do not work over my other colors but instead carrying them behind the work. You will have a few loops on the inside of the work, but this keeps the tapestry stitches from being taller than the rest of the Single Crochet. Note: For rows 39-64 you are going to repeat R38 changing colors as indicated. R39: Ch1, Sc 19G, 3B, 2G, 3B, 15G, slst to first st.
R40: Ch1, Sc 19G, 3B, 2G, 3B, 15G, slst to first st.
R41: Ch1, Sc 18G, 2R, 2B, 2W, 2B, 2R, 14G, slst to first st.
R42: Ch1, Sc 18G, 2R, 2B, 2W, 2B, 2R, 14G, slst to first st.
R43: Ch1, Sc 17G, 5R, 2W, R4, 14G, slst to first st.
R44: Ch1, Sc 17G, 5R, 2W, 4R, 14G, slst to first st.
R45: Ch1, Sc 14G, B, 4R, 2W, 4R, 14G, slst to first st.
R46: Ch1, Sc 13G, 5R, B, 3R, 2W, 3R, 15G, slst to first st.
R47: Ch1, Sc 12G, 7R, B, 6R, 16G, slst to first st.
R48: Ch1, Sc 12G, 2W, 5R, B, R, 3W, R, 17G, slst to first st.
R49: Ch1, Sc 11G, 4W, 3R, G, 3W, 16G, slst to first st.
R50: Ch1, Sc 11G, 5W, R, 4W, 3B, 4W, 14G, slst to first st.
R51: Ch1, Sc 11G, 4W, 2G, 12W, 13G, slst to first st.
R52: Ch1, Sc 11G, 3W, G, R, 3W, B, 2W, R, 2W, B, 3W, R, 12G, slst to first st.
R53: Ch1, Sc 12G, 2W, G, 2R, 2W, B, W, 3R, W, B, 2W, 2R, 12G, slst to first st.
R54: Ch1, Sc 12G, W, G, 3R, 4W, 3R, 4W, 3R, 11G, slst to first st.
R55: Ch1, Sc 15G, 3R, 2W, 5R, 2W, 3R, 12G, slst to first st.
R56: Ch1, Sc 16R, 13R, 13G, slst to first st.
R57: Ch1, Sc 16G, 13R, 13G, slst to first st.
R58: Ch1, Sc 15R, 15R, 12G, slst to first st.
R59: Ch1, Sc 15G, R, 2W, 10R, W. R. 12G, slst to first st.
R60: Ch1, Sc 15G, B, 4W, 7R, 2W, B, 12G, slst to first st.
R61: Ch1, Sc, 15G, B, 3W, 2R, 3G, R, 4W, B, 12G, slst to first st.
R62: Ch1, Sc, 15G, B, W, 3B, 4G, R, 2B, 2W, B, 12G, slst to first st.
R63: Ch1, Sc, 15G, 3B, 8G, 4B, 12G, slst to first st.
R64: Ch1, Sc, 28G, 2B, 12G, slst to first st.
Now your Fox is completed. Just jump over to the Reindeer Stocking Part 4 to finish up the Cuff and your stocking will be complete! 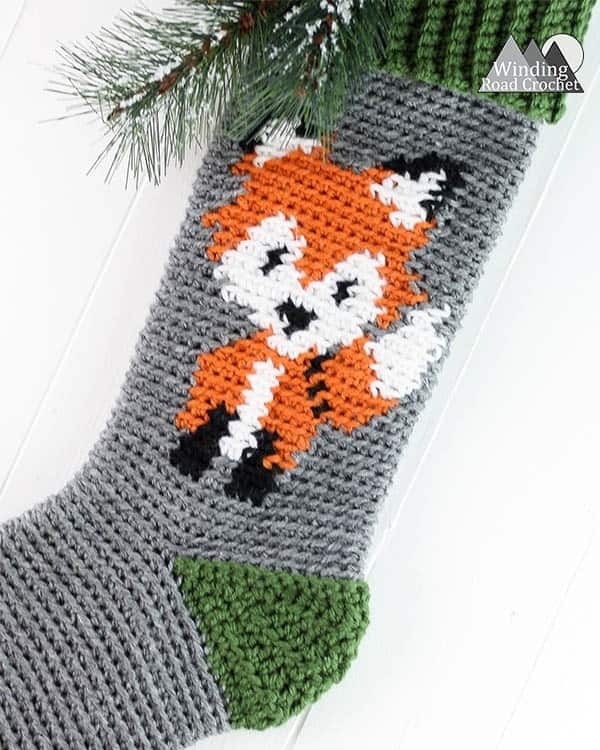 Are you going to make a Fox crochet stocking? I would love to see your crochet stocking, so share it with me on any social media! Just tag me @windingroadcrochet, #windingroadcrochet, or #ourcrochetjourney. Join my Facebook Group and share your creations with the community at Our Crochet Journey Facebook Group! More Free Fall and Winter Patterns! Sooo cute, what a lovely remix!